Java-Gaming.org > Games Center > WIP games, tools & toy projects > Brutal Fighters - Vote on Steam Greenlight!! Brutal Fighters - Vote on Steam Greenlight!! The game is completely free, no micro transactions, no ads, first truly free to play multiplayer game! Heck it's even open source! JOIN US, FIGHTERS - www.brutalfighters.com! Brutal Fighters is finally on Steam Greenlight! And a bunch of new updates are coming, I would really appreciate your vote on Steam Greenlight! Vote and support Brutal Fighters on Steam Greenlight! Yup 60fps trailer is awesome! The game that will blow your socks off! 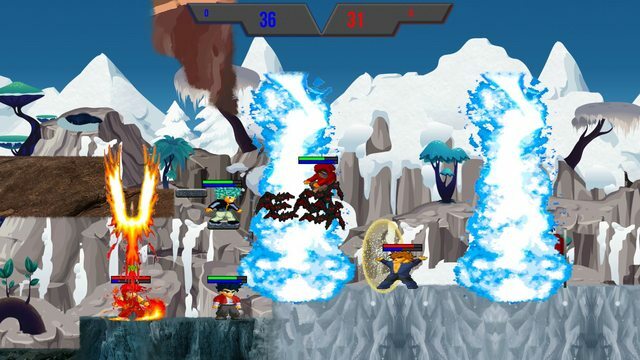 Compete with real players in a fully action fighting game! Master the skills, know your combos, and become a true fighter! Technically, what is Brutal Fighters? Brutal Fighters is a game made with Java, LibGDX, Kryonet, and other tools. Works on Windows, Mac and Linux(and every other OS that is able to run JVM should be fine too). Can we play the game? Not currently, YES! Screw Steam Greenlight, you can download the game completely for free, no micro transactions, no ads, first truly real free to play multiplayer game. Yet, the game server runs on a great VPS, with Linux Debian, but I will take care of that for you! Is the game open source? Soon, YES! The game is so open source on Github, here is the game client, and here is the game server. blog.brutalfighters.com - The development blog that every fighter reads! So what do you think? Comments will be much appreciated, especially constructive feedbacks! Because this game just really deserves it! It looks really cool, I think you're using the assets from Little Fighter 2, right? And no, I am not using the assets from Little Fighter 2 directly, I use sprites that the community of Little Fighter 2 created, I asked the moderator, and he said if I attribute those sprites to the community site, then it's ok to use them. And I did on my main game site. Looks great on the videos. The graphics are bright and have a nice softness. I'm not a fan of mortal-combat street fighter type games but this one looks interesting. For noobs like me, maybe you could make the combos executable with on-screen buttons with icons so they can all be seen. How did you implement the multiplayer code? Thanks a bunch! The graphics are somehow a bit more brighter in the videos actually. Haha do not worry, I am not a fan of Mortal CKombat style either, this game is about strategy, capture the enemy flag and bring it to your base, using teamwork, dodging enemy skills and unleashing tons of damage while defending your flag. Not similar to Mortal Kombat actually, which lacks teamwork, in fact there aren't any teams at all.. Regarding making HUD for the skills, yep it's right on my to-do list, and I even have already a basic concept of it ready. Combos are not possible to show on the HUD, you probably meant skills, combos are a set of skills and actions that dish the most amount of damage in the least amount of time, combos are planned ahead, and are trained because executing them requires great timing, and fast decision making. Well that will take pages to explain, but briefly I have a matchmaking system implemented, similar to League of Legends, Dota 2, or CSGO..
Each match runs in the server completely, all the collision detection, velocity calculations, everything runs and calculated in the server, the client gets information(in the form of UDP Packets) and interpolates what will happens next till the next packet set of information. I tested it with a pretty low amount of people, but it showed no lag or netcode problems nonetheless. But seriously, this looks really fun great work! Cool, I'm looking forward to giving it a go! Multiplayer games are the best. 1. Do the clients' simulations run some milliseconds behind the server or do they all run concurrently with the server but the clients do "dead reckoning" to simulate where the game state would be assuming nothing has changed. 2. When a new packet arrives which shows an enemy player did a mouse click and a change in direction, do the other clients 'teleport' the enemy player to his new position instantly or do you smooth the transition? 3. How do you stop the clients' game worlds becoming out of sync with the server? Does the server send the whole world every few frames? Sorry for the detailed questions. No need for detailed answers. I'm always interested in how multiplayer code works under the hood. I find it one of the hardest and most interesting things. I appreciate the questions, and discussing about how multiplayer works under the hood is always helpful. 1. I suppose the clients do "dead reckoning" although it's a bit more than just extrapolation and updating the players position using their velocity and direction, clients also calculate collision detection and such, so the clients won't be "extrapolated" into a wall for instance. 2. Good question, thanks to a good client prediction, this rarely happens, although flickering is starting around 220ms latency, which in most competitive games is a death sentence anyway. 3. By the whole world you mean all players info? Then yeah, the server sends all players info every few frames in the client, the client always extrapolate all players and sync accordingly after each server packet. I agree, multiplayer it's one of the most interesting things in game development! I hope it's clear, let me know if you got more questions or something is not clear. Sounds like a well thought-out design. Thanks for explaining it. In a first person shooter I think it's easier to hide lag since the player can shoot at a lagged enemy and still score a kill that the enemy will not protest against since he can't easily tell if he was within view of the shooter or not. So interpolating (lerping) and avoiding teleportation is a good choice. But in side-scrollers or top-down view games where all players can see the same thing, I can see why you chose to align the clients' game worlds as close as possible, despite the possible occurrence of teleportation due to lag. I wonder how you would sync the clients if you added destructible terrain or some other large-data client-modifiable feature? Because then sending updates with all the terrain data might be too much. and queue up for matchmaking. Not so many players playing the game currently so matchmaking may take a few minutes. Although you can always just ALT+TAB the game if you wish and come back when the match is just about to begin(warmup phase). All right, I am always in queue, see you out there fighters! Note: The server is in San Francisco, which means players outside NA may experience delay between inputs, but my friends told me it's not that bad, when(if) the game will get more popular, I will definitely set up another VPS game server for Europe and maybe even another one for Asia. If you wish to support the game, there is a donation link at the bottom of the main site. Nice job making a release! I played and managed to steal a flag, died to a blue dude, then I killed him a few times. I think the enemy and allied players were AI since they weren't very pro-active in killing me back. The graphics, window, menu and sounds all worked flawlessly. I was playing from Australia and though i did notice a lag of about 200 - 500ms, it was still very playable which is impressive. -Implement a loading screen after choosing a character. I actually thought the game hung when all I could see was the game logo for about 3 minutes. It was only after I tried running the game on the CMD prompt to post the error for you that I heard sound effects and noticed that the game actually loaded. -More obvious tips about the controls. I had no idea how to fight until I died and it showed the keys. -The arrow key controls work well, they never jammed. But it is a little frustrating that you can't seem to attack while jumping or moving. Edit: The lag was only between when I pressed the controls and saw a reaction on the screen. There was no stuttering or anything else. By the way, one easy way to trick the player into thinking that there's smaller lag than there is, is to make a little dust or smoke graphic at the player's feet when he presses a key to move, which is instantaneous and gives the player feedback and distracts while the actual movement eventually starts. I really appreciate it, thank you for playing! I have played 3 matches in total, the first one was a set of 6 real players, they were seriously playing good, after a good fight my team lost 3-2. After a while I couldn't find anyone(hence the logo in the middle of the screen), so I launched a few other clients and queued them up, then suddenly we had enough to start a match, so it was me combined with 3 clients and you probably, I've played only with one client thus the afks There isn't any AI in the game at all. 1. Everyone thinks it was a loading screen *facepalm*, it's the matchmaking system, it searches for other players, you waited for 3 minutes because the system couldn't find another 5 players who are searching for a match too. The game loads most of the resources during the warmup phase, which is occurring when the match is about to start, there is a 20 seconds warmup, it also shows all the controls for 20 sec like a mini tutorial. 2. The game shows all the controls during the warmup phase for 20 seconds, you probably missed it, it looks like the death/respawn phase, just for 20 seconds. 3. I definitely need to add dash attacks and such, few characters are able to attack while moving, Lust for example, he can do a jump attack. I am pretty limited to only a few sprites, and I am not an artist, but I am trying my best, thanks for the tip! 4. Sounds like a good idea, it's not my first priority but I looking forward into implementing this. Again thanks for everyone who were playing! I am still in queue..
P.S >> Who were the first 5 players I played with? Thanks! I don't even know why I didn't implemented it before, because the particle effects are ran on the client and so are the inputs, this idea will work really well, thanks for suggesting, that's my first priority now. Re: Brutal Fighters - Available for Free!! Wow, that takes courage to develop a game this far and put it on github as open source and for everyone to download and play for free But why am I your first twitter follower?? Downloading game right now and will try it out! A new update was released for the game, be sure to re-download it as it doesn't support auto update currently. An improved version of the Matchmaking Screen, now you can read cheesy funny phrases while waiting for the game to find players to match with you. The update also includes an idea CommanderKeith suggested me, client sided dust particle effect when the client is pressing a button to move, which is a great way to reduce lag notice. A Multi-Kill notification was created from scratch and added into the game, it's totally awesome! And finally a few bug fixes and other improvements and refactors as always..(currently there aren't any known bugs in the game!). More details about the update can be found in my blog post here(I post regularly about updates), or directly through the source on my Github here. You are awesome man! thank you for the kind words and the following on twitter and github. Your game project - Asteroid Fight, looks awesome, I registered on the main game site, waiting for updates! Hi, the loading screen is much better. But I've been waiting for players for a while and it seems that nobody's online. Perhaps you could have a lobby or show some information about how many players are online, or put some bots in so that a game can begin straight away. This weekend I'll give the game a go with my brothers and a friend and I'll report back how the game went. EDIT: Also, there's no back button once the loading screen is encountered. I had to alt-tab and kill the game by right-clicking the icon and closing. The game requires 6 players to start, because it's a 3vs3 game, but you can always fire up multiple clients on one computer. I managed to start a match yesterday after waiting for about 15 minutes, we had one AFK, but overall the game was smooth and fun, now it seems nobody is online, as I was in queue for quite a while. I tried playing it but couldn't find a match in half an hour. I think you should make an indicator showing the amount of online players, this way we know if it's worth waiting lol. Thanks for the tip, the indicator will be included it in the next update! Not too many concurrent active players in the game currently, therefore finding a match is rather difficult, amm hopefully doesn't sound too extreme but I would suggest planning a time in advance when everyone will queue into matchmaking in the game, then we can play a couple of matches together, and write a report here, who's in? I can email you to have a game this weekend with my brothers. Just personal message me your email. It's probably too hard to coordinate during the week with the different time zones. Guys I just checked the logs from the server, and it's funny, yesterday pretty much all day different people tried to search for a match, but not concurrently, it could have been at least 6 potential matches. Any ideas? maybe I will add an option to play against bots, but that also may ruin the multiplayer experience..
EDIT: Currently for a match you need 6 players, to play 3vs3, I am thinking to drop it to 4 players per match, so it will be 2vs2 and will be less time to wait, what do you think? Maybe a "training" mode which will notify you when enough players are online for a "real" game. A new crazy update is released for Brutal Fighters! Make sure to re-download the game at www.brutalfighters.com! I will post the features below, but feel free to also check out my Github for the source and the commits. So let's get into the main features! NEW GAME MODE: Freestyle, it's basically one infinite match where players can join and leave spontaneously, when populated it's chaos. NO QUEUE! BACK BUTTONS: Now you can return to the main menu from everywhere, the queue, fighters select, everywhere, just click on the Brutal Fighters logo. TUTORIAL AND DEBUG MODE: Hold 'O' to see the tutorial, hold 'P' to see how much FPS you have and some more details. BETTER NETWORKING: Now the game connects to the server when the game logo shows up, and a bunch of more improvements. MORE FLEXIBILITY: Especially in the server, new game modes can now be added fairly easy, and much more! IMPROVED OVERALL CODE: As usual! performance improvements, refactoring, etc.. etc.. 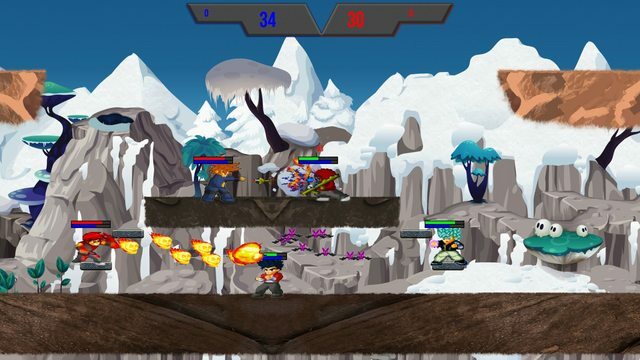 CONTROLLER SUPPORT: Brutal Fighters is a 2D side scroller fighting game, playing it with a controller would be too much fun! Hopefully you will enjoy the new update! P.S >> You can always follow me and the game on my development blog, I actually pasted everything from there! I had a game with my brother and it worked well! The dust effect was cool, made lag look less. -Should be able to shoot while jumping or walking, currently the player seems to be able to shoot only when standing still. -Doing basic attacks while standing right on top of one another seems to not affect the enemy. This means that players having a fist fight move closer until they're on top of each other then no damage seems to be done. -Not being able to fight when holding the flag is frustrating, particularly when there's 2 people playing and both have each others' flag! 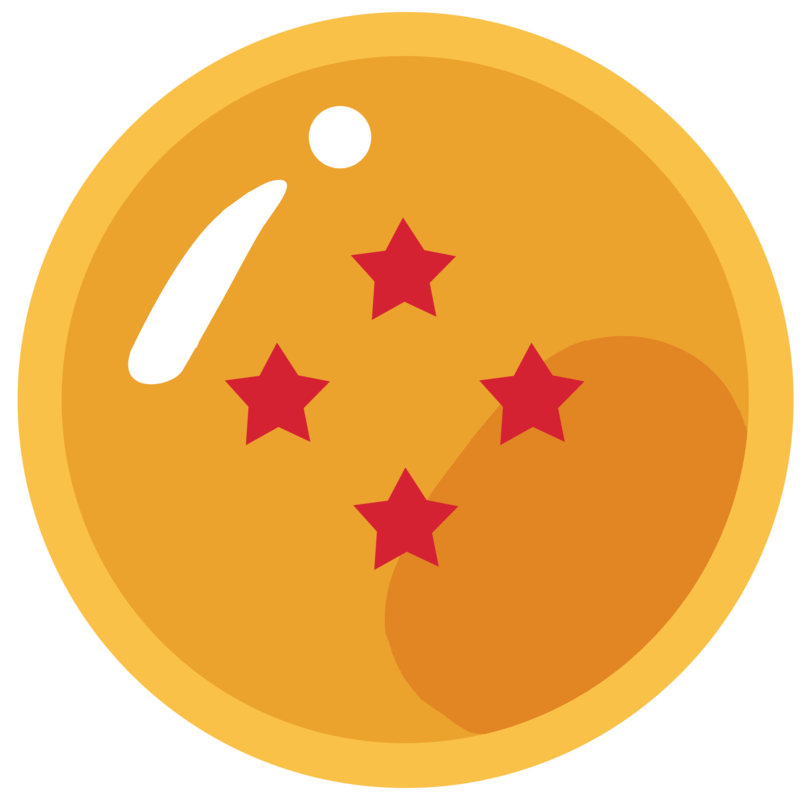 -Level ups, items, commentator who announces triple kill bonuses and so on. Thank you a lot for trying the game! I am glad it ran flawlessly, without errors or jittery-ness! It makes me really happy to hear that you and your brother gave it a go! 1. I am pretty limited to the sprites, but you are right, it's definitely time to work something out in that regard, aren't we indie game developers after all? 2. Easy fix! the auto-attack hitbox X position should not include the flip side, thanks a bunch for telling me! 3. I can easily enable fighting while holding the flag, but in my opinion, in any case except 1vs1 scenario, enabling it will be a bad design choice. when it's disabled it encourages team work, the player who's holding the flag is very vulnerable as he cannot defend himself, the team has to defend him from enemy attacks, in a funny scenario when both teams have stolen each other's flag, players got to be creative, otherwise it's a 1vs1, then it's frustrating, I will look into that, perhaps I will enable fighting while holding the flag only when it's a 1vs1 situation. 4. Will look into that, although it's not my highest priority to be honest, because developing a good convincing A.I is really hard. 5. Haha when I read this, I thought to myself - "someday..someday.."
Thank you for the suggestions, I am really happy that it worked well for you! It's completely free, no in-game transactions, no ads, completely free + open source, and I personally take care of the servers too, so I really don't get anything from it(sadly some people think I do and love to show hate), just to hopefully let people join and enjoy the game. If you like the concept, please vote and share, I am not really into "marketing", I am just a java game developer, so if you like it please vote and share, I would really appreciate it! Sorry, I have probably missed something obvious but where is the download link? I haven't found it on your main website. Oh I need to update the thread, I redirected the download link to the steam greenlight link, essentially my goal is to gather some followers to the game, then release it so multiple people will join at once, that way you won't need to wait for a match.